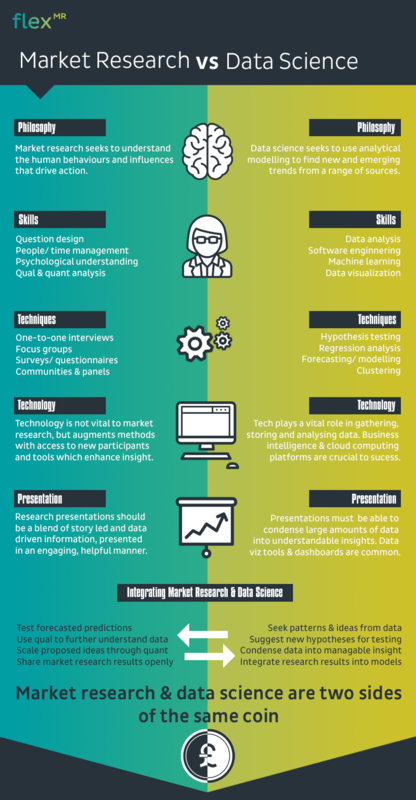 Market Research vs. Data Science: What's the Difference? Data science is an interdisciplinary field which involves analysing raw information (both structured and unstructured) to find statistical insight that informs business decisions. To those in market research, this may seem like a familiar description. In fact, the role of market research is almost identical. So it is surprising that the two disciplines have grown apart so much - so much so that they are often in competition for business, budgets and influence. So is there more to market research and data science than meets the eye? Are there hidden nuances that have caused rifts between practitioners? The truth is more complicated than first thought. There are important traits each have that influence how researchers and data scientists interact. But most importantly, there is a widely held belief on both sides that their approach (and by extension, results) are more accurate, trustworthy and reliable. Whether this is true or not is difficult to judge. As with all competing disciplines there are advantages and drawbacks to both. A successful business will not just harness the insight generated by market research and data science teams, but take it one step further by integrating insight finding mechanisms. To achieve this requires an in-depth understanding of how both work. In this infographic, we unpick the key similarities and differences between the two disciplines and seek opportunities to integrate both to help make more informed decisions. Data science and market research vary most in their practical application and the skills they demand. Their end goals, however, are strikingly similar. Both seek information and insight which is used to improve the decision making capacity of managers and executives. In this regard, it seems that there is no need to define a difference between the two disciplines. But the skills required for each are so drastically disparate, that separate teams are required. In a traditional organisational structure, this leads to a silo mentality; one not helped by the terminology barrier. In the years to come, breaking down the barrier between data science and market research will be critical to business success. No organisation can survive by understanding past behaviour or future predictions alone. As much as this separation leads to poorly informed decisions, it leads to significant inefficiencies within business too - as both departments are in constant competition for budget, value and influence over decisions. Successful businesses must eradicate this internal competition and find ways to merge teams in a way which makes effective use of both fact-based quantitative data and rich, emotive opinion. How does your business structure market research, data science and business intelligence to make informed decisions? Want to find out how you can break down the barriers between research and data science teams? Watch our free webinar today. Or, watch a short two minute demonstration to see our platform in action.